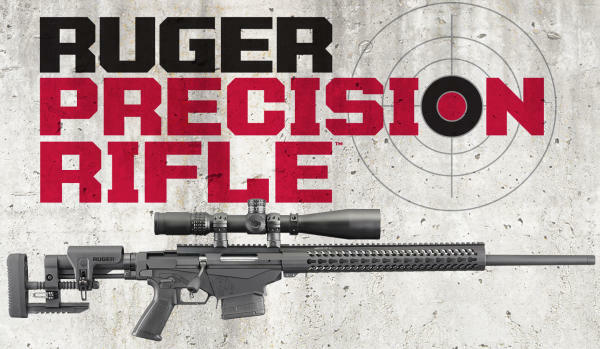 Ruger has introduced one of the most important factory rifles in years — the new Ruger Precision Rifle (RPR). 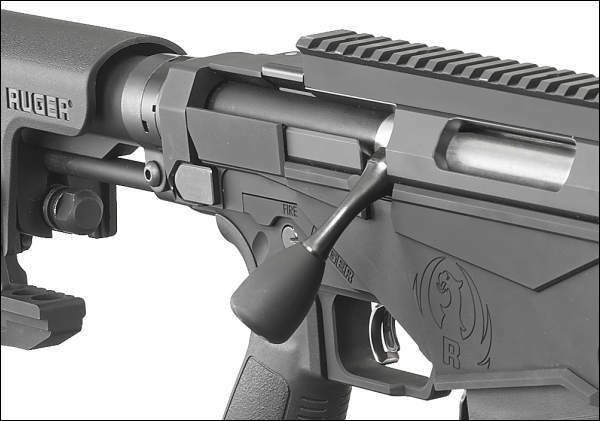 The new RPR features the three-lug (70° bolt throw) action from the Ruger American Rifle mounted in a modular chassis system with many innovative features, such as cam-lock buttstock adjustments, and a “universal” mag well. Even with a hammer-forged barrel, the gun is very accurate. Everybody who has shot this gun so far has been impressed. This is a smart design, well executed. We predict Ruger will sell a ton of these guns. The new RPR is logical step up for AR owners seeking better long-range accuracy (and easier maintenance). The RPR is currently offered in three chamberings with three different barrel lengths: .308 Win (20″ bbl, 1:10″-twist, 9.7 lbs); 6.5 Creedmoor (24″ bbl, 1:8″ twist, 10.6 lbs); and .243 Win (26″ bbl, 1:7.7″-twist, 11.0 lbs). 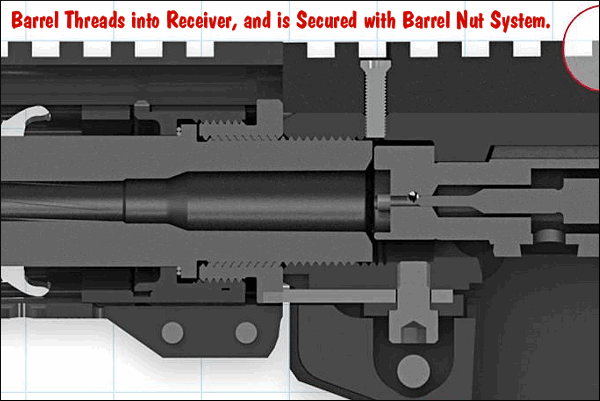 All barrels are hammer-forged with 5R rifling, and are threaded 5/8″-24 at muzzle for brakes and suppressors. MSRP for all three models is $1399, so expect street price to be under $1200. You could pay that much for some tactical chassis systems by themselves, and then you’d still have to purchase action, barrel, and trigger! The lower receiver is CNC-machined from a 7075-T6 aluminum forging, Type III hard-anodized. 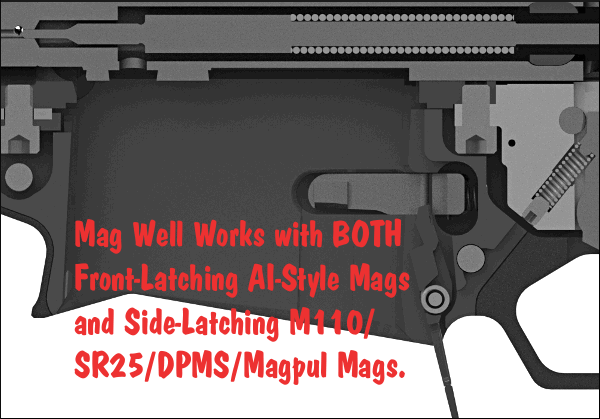 The mag well front is contoured for bracing against shooting supports. The rifle even comes with a built-in +20 MOA tapered Picatinny scope rail. The trigger, unique to this gun, adjusts from 2.25 to 5 lbs. using a special tool that stows in the bolt shroud. The trigger has a Savage-type safety insert. The buttstock is fully adjustable with quick-adjust cams. But if you prefer a different style of buttstock, that’s do-able — the left-folding stock hinge is attached to an AR-style buffer tube, so the MPR will accept any AR-style stock. Likewise, you can attach any AR-compatible forearm to the RPR. Notably, Ruger has seven patents pending for this new rifle — that shows the design innovation packed into the RPR. Ruger is pursuing patents on the universal magazine latch system, dual barrel nut system, trigger system, dual-action stock cam levers, bolt body design and other features. The RPR boasts a Universal Mag Well that works with front-latch AND side-latch mags. 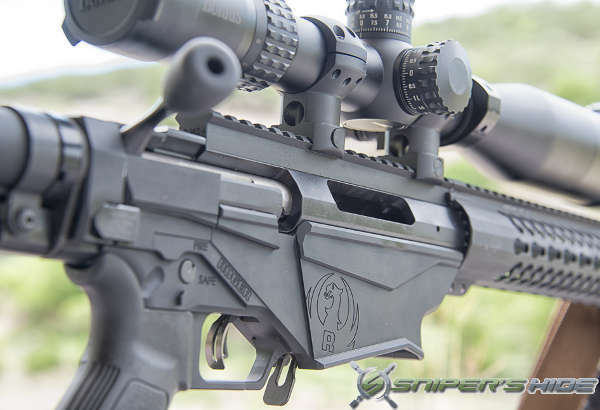 Frank Galli, head honcho of Snipers’ Hide, recently tested the 6.5 Creedmoor version of the RPR. Galli says the rifle offers excellent accuracy and an impressive feature set. Galli believes the RPR offers great value compared to a custom-built tactical rifle that could cost $3500 or more. Read Galli’s detailed review on the Sniper’s Hide website. This is a full-featured, precision rifle with an entry-level price tag. The feature list of this rifle is huge. I could probably write 1800 words and still not explain everything packed into this rifle. But suffice to say, it’s customizable. If you wanted to change the stock, use any AR15-capable stock, Magpul PRS, no problem. Want to change the fore-end, same thing, you can add any AR15 fore-end…. The only feature you cannot change is the trigger. At distance, it’s easy to say, this rifle performs, in the video we [show] a 1/2 MOA Group at 850 yards on steel. The muzzle velocity with factory 140gr AMAX is 2810 fps out of this rifle. This is the entry-level precision rifle that can put you in the mix of any precision rifle competition held anywhere in the US for under $2500 with scope. What is your excuse now? Share the post "New Ruger Precision Rifle Is a Game-Changer"
Share the post "Big Unclaimed Special Order Sale Now at Midsouth"